Image Size: 44"w x 22"h.
We hear the dominant roar of freedom’s voice as the U.S. Air Force Demonstration Squadron, the Thunderbirds, pulls tightly into its famed delta formation and slices into turbulent air above Arizona’s Grand Canyon. We listen for an echoing growl of thunder as a mythical Thor reigns throughout the sky, leaving distant vestiges of a passing storm. Our eyes are drawn throughout the painting, from the Colorado River far below to the crimson, sun-tipped heights, from the misty clouds hovering over the gorge to the tops of the cumulus build-ups reflecting a welcoming sunlight. We are invited to share the artist’s two loves―landscape and aviation. Phillips has researched his subjects well. He has flown over and hiked throughout the majestic canyon, familiarizing himself with its dramatic buttes, mesas and the variegated beauty of its eroded walls. He has flown with the Thunderbirds, the name honoring the Native American legendary and masterful bird and with tactical F-16 squadron pilots. The Thunderbirds, resplendent in red, white and blue, represent the U.S. Air Force and the United States of America and invoke feelings of pride and patriotism in the millions of people who are treated to their aerial displays. 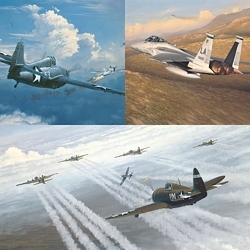 The elite team, which performed its inaugural flight in 1953, was equipped initially with the F-84G aircraft. Thirty years after rising from the Southwestern desert at Luke Air Force Base, the team selected the sleek F-16. Since 1983, this multi-task fighter has benefited the Squadron and all who fly her in protection of the boundaries of twenty-four nations.